Even if they don't find the "gay gene." one would still think there is plenty of reason not to worry that not everyone leads "lifestyles of procreation." There are more than enough people. Evidence for genetic basis of gayness is convincing, to some, but not all. The jury is still out. 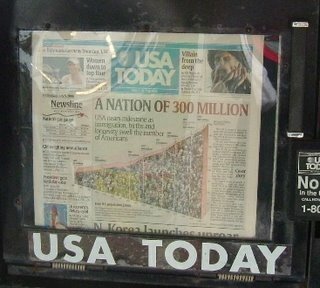 A recent interview, on National Public Radio, brought me yet another perspective on the natural state of human beings. Genetics does not really dictate our sexuality. One of the beauties of our genetic makeup is that we are given a lot of flexibility. Human behavior, including sexual behavior, is not rigidly dictated by genetic programming. This gives us the ability to adapt our behavior to changing circumstances. Maybe the genes drop a few hints, but they really don't say as much as some folks might think. We have the inherent ability to be quite adaptable. Adaptability is an attribute for survival. Even thinking about "survival of the fittest" the species with the most offspring is not necessarily the one most likely to be survive. "Quality," rather than just "quantity" makes a difference. Elephants, for instance, don't have a lot of offspring, but they take real good care of the offspring they have. Our genetics may dictate things about the workings of our kidneys and heart, but the more interesting area of human behavior is not necessarily a slave of genes. The ability to use "free will" and adapt to changing circumstances, in our environment, is a great thing we have inherited. We ought to be glad we have this flexibility. I don't think there is anything in the "program" that says, "everyone must procreate" to "get with the program." There is an old phrase that goes, "come on, get with the program." One can ask, "what program?" These thoughts are inspired after an interview, I heard several weeks back, with a Professor named David Barash, at University of Washington. Another way to adapt to growing population. Don't litter. More people, more need to curtail things like littering. 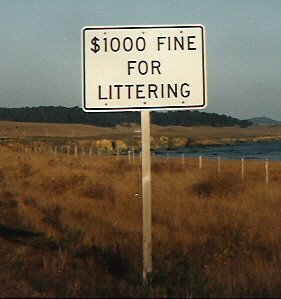 dollar fine for littering" impressed me. It was on my 1988 bike trip to southern California. Somewhere around San Simeon. "Wow, thousand dollar fine for tossing a candy wrapper." Now, these signs are common place; even here in Washington State.